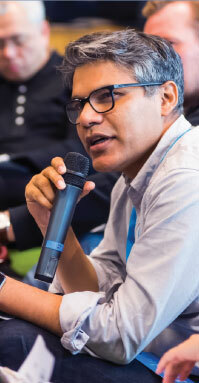 Sajid Rahman is one of those few Bangladeshi business leaders and entrepreneurs who has experience of working at the highest levels of leading global companies. 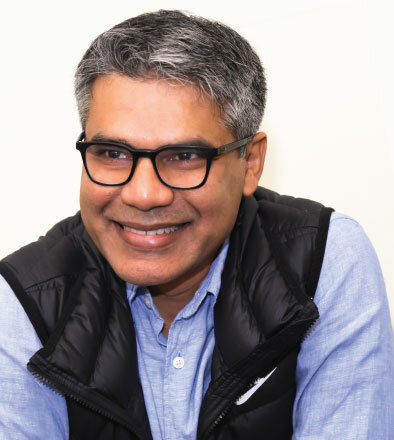 Currently leading the global health initiative for Telenor Group, Mr Rahman is also working closely as advisory board members and investors to technology and energy companies in United States, Asia and UK. FINTECH: Before going into specific questions about your work could you talk about digitization? That is the buzzword right now, and probably rightly so. It is important beyond any doubt, are we hoping more from it than we should? S Rahman: I don’t think you can overstate the importance of digitization. Buzzwords can be misleading, but not in this case. 12 crore people in Bangladesh have access to mobile phones, but they don’t have access to bank accounts, or a proper education. This holds true for most people in the world. There are approximately 5 billion mobile phone users in the world, but most of them don’t even have access to something as basic as clean water, forget education or healthcare. The mobile phones in our pockets have more processing power than the Apollo that took men to the moon. Imagine that! 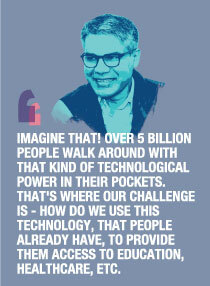 Over 5 billion people walk around with that kind of technological power in their pockets. That’s where our challenge is – how do we use this technology, that people already have, to provide them access to education, healthcare, etc. That’s where digitization comes in. See, if there’s a book that is rare and a lot of people need it, then we have to make copies, and the cost of photocopying per book is going to rise, the quality of printing is going to be different and possibly low, etc. 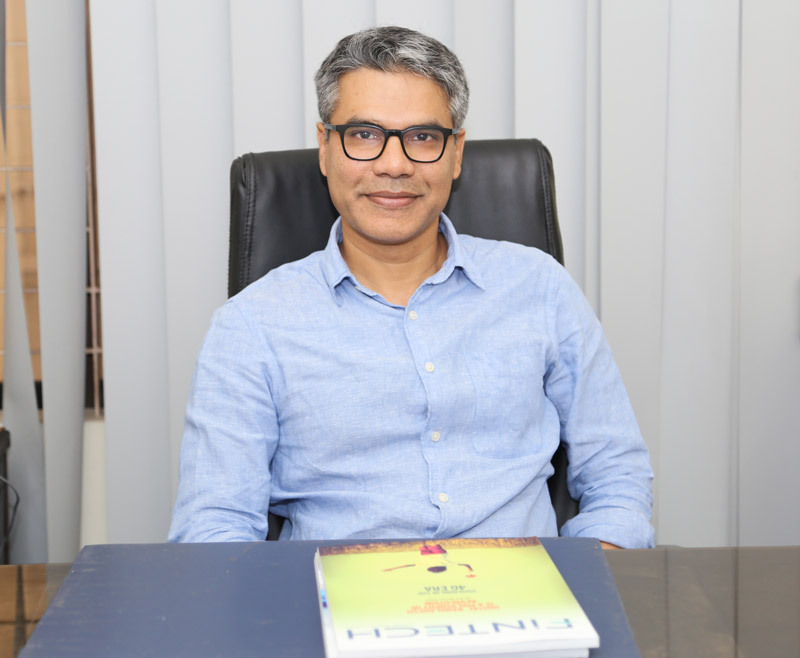 But if we digitize the book, send it around as an e-book, then the quality will remain the same and there will be almost zero additional costs. So if we could digitize education and healthcare, we could provide millions of people access to these services, without incurring any additional expenses or compromising with the quality. If we can digitize these services and provide them using mobile phones, then I believe we could make a huge impact on people’s lives in the country and around the world, and solve some hard problems. You’ll see these days there are several startups that work on problems like how to communicate better, or how to take better photos, which are simple problems. Problems like how to make people’s lives healthier, how to provide access to the financial sector, I think those are bigger problems, and that’s where technology and digitization plays a role. That’s what Telenor is working on. FINTECH: You worked for ANZ Bank, which is such an ideal place for most people, like no one who has worked there has ever been unsuccessful in their lives. How did you evolve from the banking sector into the work that you do today? S Rahman: As it was a foreign bank, there was a well maintained banking system and training in place, and a lot of people grew within that system. People who worked in the banking sector at that time under that system, grew up to be quite successful people. In my case, I worked with Grindlays and Standard Chartered Bank, and then I moved abroad and worked at several places, I was in Africa, then in Indonesia. What I realized was that there are several gaps in the banking sector. The kind of challenges and problems that lie ahead of us, are not what traditional banks and banking systems are capable of addressing. If you take a look at the fact that 12 crore people in Bangladesh have access to mobile phones, but do not have bank accounts, it shows that the banking sector is not capable of expanding on such a large scale, yet. That’s when I realized that perhaps if I worked in the technological sector, there’s more room for solutions and making an impact, and it will be more exciting personally and socially. That’s when I left the banking sector and transitioned into financial technology. I worked with companies from Indonesia, Singapore, Hong Kong and Silicon Valley. And started getting involved deeper with technology, companies that are working on cutting edge areas like asteroid mining to alternative energy to DNA editing. FINTECH: The fossil fuel industry is flourishing as usual, even though it is not sustainable or good for the environment, it doesn’t seem like it’s going to stop anytime soon. What are your thoughts on an alternative source of energy? S Rahman: If you look at the energy sector, in general, renewable energy is quickly growing. The main challenge was that the energy cost of renewable energy was higher than that of fossil fuels, but it’s changing now, and cost of solar and wind energy is lower, thus the demand for renewable energy is increasing. Before wind energy Power Plant was built in high wind areas, but now the cost has gone down, as wind energy is equally profitable in low wind areas like Bangladesh. I strongly believe that with the development of technology, the profitability of renewable energy will become higher than traditional sources like fossil fuels. Development is usually dependent on economic interests. So once people realize that renewable energy is equally if not more profitable, it will become the prominent sources of power supply. FINTECH: In Bangladesh, VC culture hasn’t developed yet, and there is no ecosystem for it. You have introduced a Silicon Valley company here, so do you think there is a future for it here in Bangladesh? S Rahman: What we have started is more of an accelerator program. We used to take startups that are in a conceptual stage and turned them in a real business. VC culture is like a virtuous cycle. If you look at Silicon Valley, at first there are investors who fund the companies at seed stage. Out of about hundred companies, let’s say just about 95 of them fail, and 5 of them go on to become big companies like Facebook, Google, etc. People who work in these 5 places earn a lot of money on exit and come back to contribute to the ecosystem as investors creating a virtuous cycle. In Bangladesh, the first challenge is that this cycle has not been completed yet as there haven’t been similar exit successes. Another challenge is that in Bangladesh, when people have money in their hands, they would rather invest in lands or other real estates rather than in startups. They are worried if it is logical to invest or if there will be a beneficial outcome. So that’s a big reason why the VC ecosystem will take another 5 years or so to develop in this country. On the bright side, foreign investment in Bangladesh for startups is on the rise, and therefore I see a lot of growth on that end. FINTECH: You yourself have invested in several concepts, like Hyperloop One, how is that going? S Rahman: Hyperloop One is doing quite well and it is based on a concept by Elon Musk. Richard Branson from Virgin recently became its chairman and now is called Virgin Hyperloop One. Elon Musk, as you may know, has built companies like Tesla car. He has also built SpaceX, with the ambition to send people to Mars. He believes we are interplanetary beings. Similarly Musk believes that if we could build a transportation system where we take out the air and reduce friction so it could travel like a bullet train at the speed of sound, then say we could travel from Dhaka to Chittagong in under 20 minutes at a cheaper cost. That is the concept of Hyperloop One. The company has already partnered with several governments to roll out the solution. I strongly believe that if this project becomes successful, then it will have an impactful change in the world. Another project that I was involved with is called Planetary Resources. Asteroids are a huge resource for minerals and can be a great source of wealth for this world. This project aims to mine resources from asteroids. Another project is Caribou Bio-sciences who do DNA editing, which involves changing people’s DNA structure to cure hereditary diseases like diabetes. Recently a company got FDA approval for a medicine that alters DNA and cures a certain type of blood cancer in children. FINTECH: Last year Elon Musk and a couple of other technologists recently wrote a letter warning about AI and recommending being careful about how it is developed. How that was received by people in the related fields? S Rahman: Technology is neither good nor bad, it all depends on how you use it. The thing with AI is that some technologists believe that it has the potential to overpower human society and control humans. Technologists (like Elon Musk) who believe in this are working on two concepts. One is called ‘Open AI’ where anyone developing AI should keep the information open and accessible to all. Second concept is called Neuralink which is co-founded by Elon Musk and others. Neuralink is trying to connect computer with human consciousness. FINTECH: These ideas are no longer hypothetical in a way, but still probably considered far-fetched. Do you really think people receive these seriously? S Rahman: The thing with development in technology is that people don’t understand the impact until a certain stage has been reached. There are 2 kinds of AI, narrow intelligence and general intelligence. Narrow intelligence is used to solve specific problems and people have been using it for a long time now. It is growing rapidly. A report shows that when it comes to diagnosing breast cancer among women doctors were right 80% of the time and AI was right 95% of the time. So AI has been used for such purposes. General intelligence involves the AI having the ability to apply human like intelligence, but this is still very much in the developing stage and therefore people do not understand its implications. It basically means that the AI can think like us and even though it’s not very popular now it is also growing at a rapid rate. FINTECH: Bangladesh does not have a primary database that collects patient records. If we could work on this do you think there would be an impactful change within the country? S Rahman: We have introduced a digital health service called Tonic. It’s 365 days 24 hours health consultancy and health insurance service for people. If someone has a headache in the morning they can call and consult a doctor, if they feel they need to see the doctor in person then they can also make an appointment through the service. We have provided the service to over 300,000 people. Slowly and steadily we have started building a database for patient records in Bangladesh. FINTECH: Telenor Health is focusing on NCD or ‘non-communicable diseases’. The rationale is apparent for this. But tell us a little bit about your process for arriving at this policy. S Rahman: When a drive for focusing on ‘non-communicable diseases’ started, then Bangladesh and other developing countries, we kind of responded by saying that these were diseases of the rich, and we need to focus on cholera and TB etc. So, we focused on those, and actually did a very good job. If you look at the data, we have improved a lot, in fact one of the best in the world in child mortality or nutrition. 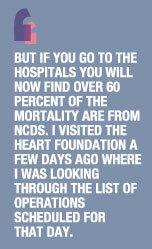 But if you go to the hospitals you will now find over 60 percent of the mortality are from NCDs. I visited the Heart Foundation a few days ago where I was looking through the list of operations scheduled for that day. There were about 40 to 45, among them 26 of the patients were under 40 years of age. The fact of the matter is that NCDs are on the rise in Bangladesh because of lifestyle and other factors. So, one of the important aspect about these diseases is that they are very expensive to treat. That is why we decided to focus on NCD. Globally it’s a big focus too. A good thing about NCDs, if you can call it that, a lot of these can be prevented. If you manage your lifestyle and manage to get early consultation,then these are very preventable. FINTECH: Apparently choosing Bangladesh to start your operation is very logical, as you already have a very strong presence here. Is that what you thought too? Also since Bangladesh yet to have very solid policy and legislation for tech based services, does this allow you to experiment and fine tune your services more freely? S Rahman: Yes, of course. Grameenphone’s presence is obviously a very important factor. As for established policies and rules, digital health is new globally as well, not just here. That’s not really the reason. The main reasons for coming to Bangladesh firstly, as you said, Telenor has a big presence in Bangladesh. And the second reason is that this product is very relevant in Bangladesh. According to the World Health Organisation there should be one doctor for every three persons. In Bangladesh there is one doctor for over one thousand people. The gap is bigger even in the rural areas. So, this is very relevant in Bangladesh. 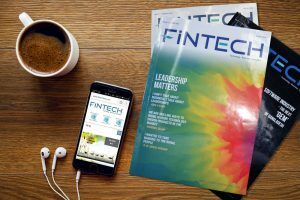 FINTECH: Can you take this out electronically or online? S Rahman: We have made the whole process electronic. You are not taking out an insurance, but you are buying a membership of Tonic. The membership fee for that is taken from your mobile phone credit every month. If you get admitted in a hospital and stay for three nights, then we will check on the backend and pay you the money, after you send the photos or soft copies of the discharge letter and other relevant papers to us on email. FINTECH: How much is paid under this package? S Rahman: We have what is called ‘Tonic Astha’ and ‘Tonic Shurakkha’. If you have the Astha you get Tk 10 thousand and for the other one you get Tk 25 thousand, ten times in a year. The annual amount allotted is Tk2.5 lakh. But you are paying only Tk290 per month for that. That comes up to at most Tk3,600 a year. If you are not admitted to a private hospital, this amount gets you quite a long way actually in Bangladesh. We have also recently launched Tonic Asha, which costs tk 47 per month and provides a coverage of tk 40,000 annually as well as many other benefits. FINTECH: When do you anticipate Telenor Health might be able to launch in other countries? S Rahman: Many governments from different countries are expressing interest about this. In fact, in some of these countries Telenor is not present. We have about 50 lakh customers in Bangladesh already which we acquired in the last one and half year. So, we will start to look into another market in the second half of this year and at the start of 2019 we will start to expand to another market. FINTECH: Tell us about the software you use. Where and how it was developed? S Rahman: Everything was developed locally. We have a very strong local team of coders. We have our own system for everything, for example, for capturing the data from the doctors. Also for the cash claim there is an end-to-end system. There are a number of apps and a few core systems on which those apps were built. All of these were locally developed. 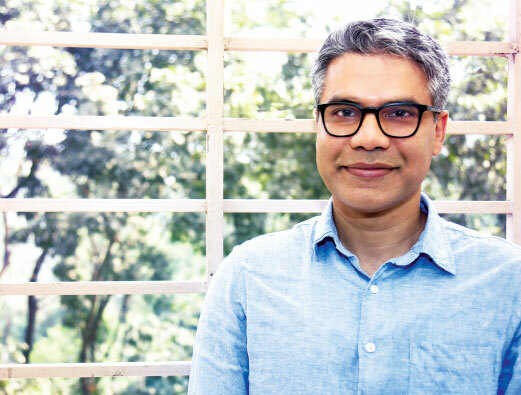 FINTECH: Are companies in Bangladesh using user data to create better products? 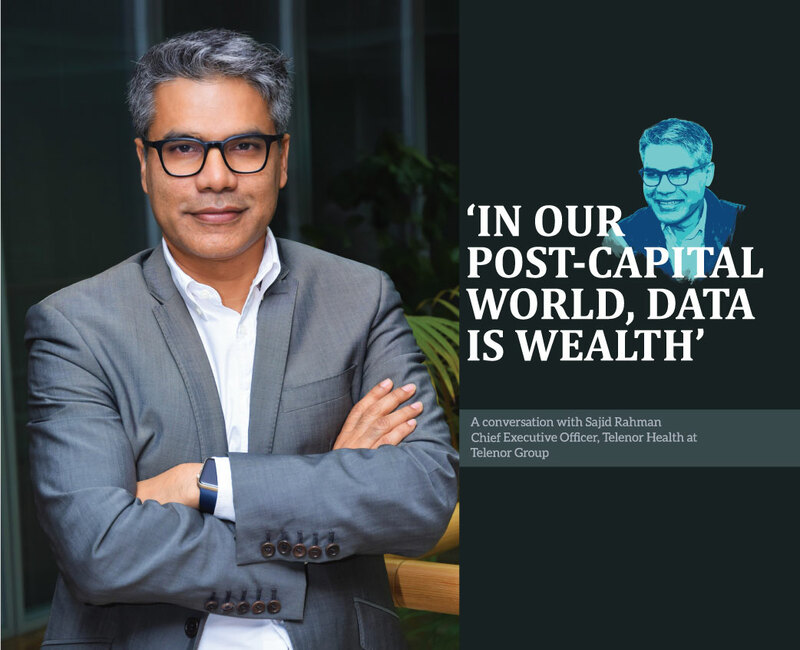 Is Big Data not taken seriously in Bangladesh? S Rahman: Big Data is not being used in Bangladesh at any significant scale. There’s a lot of scope for it, no doubt. One problem is that a lot of the data is not digitized. And data is as good as the quality of the data. There are restrictions on using data as well. FINTECH: A lot of people seem to be thinking that Bangladesh is not there yet. We are not big enough for Big Data. What is your thought on that? S Rahman: You need quality data and you need skilled people. But there is no time limitation on this. If you can use Big Data today, then you will get the result today. It’s not like it will be relevant after ten years. Big Data is relevant today for all of us. If you look at history, land was the source of wealth in the past. Later on we had capital. Rockefeller and these people became powerful because they had capital. Now, if you go to the New York Stock Exchange and look at the top five companies, they are not Chevron or BP. These companies are Google, Facebook, Amazon, Microsoft and so on. The reason is that every time you look at your phone a data is derived from that. The source of these companies’ wealth is ‘your attention’. They are competing with each other for your attention. The better one of them can hold your attention the more ‘wealth’ that company has and more power it has. FINTECH: BASIS has the goal of reaching one-billion mark in software exporting. It seems the potential is there, but we are not reaching to the point where we can generate that kind of revenue. Why do you think that is? S Rahman: I think we arebehind in marketing. If you look globally, the software outsourcing market is controlled by a few countries. They have strong marketing presence globally. We don’t have that. We have very good coders in the country, but we don’t have that level of business people who can represent these companies globally. So, I think that is the big gap. But the potential is clearly there. FINTECH: There is a large number of commercial banks in the country and all of them say that they care about startups. But startups inevitably struggle with funding. What should be commercial banks’ role in this? S Rahman: Many companies say that they care about startups. It has become a trendy term. Startup is just a buzzword in the banking sector, but no one is really working on this in a significant way. Secondly, it is true that it is difficult to work with startups in the banking sector. I think for the best example of working with startups you have to look at DBS Bank in Singapore. They are very strong. They have their own accelerator program, their own funding and they facilitate a lot of startups. The way the concept of startup work in the banking sector is that you outsource your resource to a startup, because you don’t have that resource or that skill set. May be you want to work on blockchain but don’t have the resource. What you do is fund a startup that work on blockchain. When they do something of value you acquire the company and bring the people under the bank. Essentially that is the business model for bank in regards to startups. So, I don’t think that is how banks are thinking and operating here. Another matter is that I hear people saying that banks should invest in startups. I think that is very risky. The reason is that banks have a fiduciary responsibility. The responsibility of the banks is to protect the deposit. If you invest that on a startup, then it becomes risky. 90 or 95 out of a hundred startup are failures. So, that is very risky for banks and they don’t have the skill set for it either. The way investment is done in startup is through venture capital. That is a very different business model. It is like if I invest a hundred thousand dollars to a hundred startup, 90 of those will be lost and will not return. Five of them will probably return a little bit, say two thousand each. One out of the rest five will return one thousand times my investment. That will cover the initial investment and provide huge profit. May be that one company will be Google or Facebook etc. That is the business model of venture capital. And you will have to wait may be 10 years for that and in the initial period you will probably lose all the capital. This is not the structure within which banks operate. FINTECH: Thank you very much for speaking with us. S Rahman: You are welcome.